The worldwide elderly population with its associated health concerns is expanding rapidly. Globally, the proportion of individuals older than 80 years currently averages 5%. In the developed world, almost 15% of individuals will be older than 80 years in 2020; the proportion is expected to increase to 25% by 2050. This aging population has associated comorbidities; consequently, clinicians are often asked to evaluate the preoperative risk status of this high-risk population. See algorithm for preoperative cardiac assessment below. Perioperative cardiac management. Algorithm for preoperative cardiac assessment. The cardiovascular systems of patients who undergo general anesthesia and noncardiac surgical procedures are subject to multiple stresses and complications. A previously stable patient may decompensate postoperatively, leading to significant postoperative morbidity and mortality. A substantial number of all deaths among patients undergoing noncardiac surgery are caused by cardiovascular complications. Each year, approximately 30 million individuals in the United States undergo noncardiac surgery. Approximately one third have cardiac disease or major cardiac risk factors. Current estimated rates of serious perioperative cardiac morbidity vary from 1-10%. The incidence of perioperative myocardial infarction (MI) is increased 10- to 50-fold in patients who have had previous coronary events. The cardiovascular effects of general anesthesia include changes in the arterial and central venous pressures, cardiac output, and varying heart rhythms, which occur by the following mechanisms: decreased systemic vascular resistance, decreased myocardial contractility, decreased stroke volume, and increased myocardial irritability. Induction of general anesthesia lowers systemic arterial pressures by 20-30%, tracheal intubation increases the blood pressure by 20-30 mm Hg, and agents such as nitric oxide lower cardiac output by 15%. The use of fentanyl, sufentanil, or alfentanil results in less myocardial depression compared to inhaled anesthetics. Yet, these intravenous agents still cause venodilation, thus reducing preload and, hence, depressing cardiac output. Patients with congestive heart failure (CHF) are particularly sensitive to these hemodynamic changes. By increasing the preoperative volume status and applying the Frank-Starling principle, this decrease in cardiac output can be offset. Additionally, inhalational and intravenous anesthetics along with muscle relaxants can be detrimental by sensitizing the myocardium to circulating catecholamines. As a result of the stress of the surgical procedure, circulating catecholamine levels are elevated, thereby increasing the risk of ventricular ectopy. Both epidural and spinal anesthetics cause arteriodilation and venodilation by blocking sympathetic outflow, decreasing preload, and, ultimately, reducing cardiac output. To offset this deleterious effect, the clinician may volume load the patient preoperatively. However, this intervention increases the risk of postoperative CHF by 10-15%. Approximately 50% of patients in the United States who are aware they have hypertension are either not treated or inadequately treated with pharmacological therapy. In the perioperative period, poorly controlled hypertension is associated with an increased incidence of ischemia, left ventricular dysfunction, arrhythmia, and stroke. Patients with hypertension are at a higher risk for labile blood pressure and for hypertensive emergencies during surgery and immediately following extubation. Patients should continue taking preoperative antihypertensive medications throughout the entire perioperative period. The goal should be a systolic blood pressure less than 140 mm Hg and a diastolic blood pressure lower than 90 mm Hg before proceeding with elective surgery in the ideal situation. In any patient with stage 3 hypertension (ie, >180/110 mm Hg), blood pressure should be well controlled prior to surgery. Intravenous esmolol, labetalol,nitroprusside, or nitroglycerin may be used for acute episodes of hypertension, whereas calcium channel blockers or angiotensin-converting enzyme (ACE) inhibitors may be used in less acute situations. Ischemic heart disease (IHD) is a major determinant of perioperative morbidity and mortality. During the 1970s, several studies reported a 30% risk of reinfarction or cardiac death for patients undergoing surgery within 3 months of an MI, 15% when surgery was performed 3-6 months after an infarction, and 5% when the operation was performed 6 months later. However, this traditional definition has been replaced by the consensus of the American College of Cardiology (ACC) Cardiovascular Database Committee. In particular, an acute MI is now defined as occurring within 7 days, a recent MI is defined as occurring within 7 days to 1 month, and a history of prior MI refers to an event occurring more than 1 month previously. True lifesaving procedures should be performed regardless of cardiac risk, but consideration should be given to performing elective surgery 4-6 weeks following an MI. In patients requiring semi-urgent surgery, the patient's risk should be evaluated with prognostic studies (see Preoperative Risk Assessment). In a 1990 report, Shah et al revealed that 25% of patients with unstable angina had an MI after noncardiac procedures. Medical therapy and/or revascularization are necessary to ameliorate this risk factor. No evidence-based trials compare perioperative cardiac outcome after noncardiac surgery for individuals treated with preoperative percutaneous coronary intervention (PCI) versus medical therapy. Indications for PCI in the perioperative setting should adhere to the ACC/American Heart Association (AHA) guidelines established for PCI in general. In the setting of PCI without stenting, wait 1 week prior to surgery. In the setting of PCI with a coronary stent, wait 4-6 weeks prior to noncardiac surgery. Aortic stenosis (AS) is associated with a 13% risk of perioperative death. Risk varies based on the severity of AS. The death rate associated with critical AS is approximately 50%. While taking a history, the clinician should inquire about symptoms of syncope, angina, and dyspnea. During the examination, assess for a crescendo-decrescendo murmur in the right intercostal space radiating to the carotids. Pulsus parvus et pulsus tardus, a soft second heart sound (S2), a late peaking murmur, brachioradial delay, and an apical-carotid delay should raise the suggestion of AS. Critical AS is often characterized by an absent S2 and pulsus parvus et tardus. Echocardiography revealing an aortic valve area less than 0.7 cm2 and/or a mean gradient of 50 mm Hg/peak gradient of 80 mm Hg is deemed critical stenosis. The clinician should delay surgery, except for emergencies, and should consider preoperative valve replacement in these selected patients. The clinician must remember that patients with atrial fibrillation and prosthetic heart valves are on anticoagulation therapy. Warfarin (Coumadin) therapy should be discontinued 4-5 days before elective surgery, given its half-life. Patients at high risk for thromboembolic events include those with prosthetic valves in the mitral position, atrial fibrillation associated with mitral valve disease, and a history of thromboembolism. Such patients should be admitted for intravenous heparin treatment. Outpatient therapy with preoperative low molecular weight heparin instead of conventional unfractionated intravenous heparin is often used, although no randomized controlled trials have validated this protocol. Patients with highly thrombotic valves (eg, Star-Edwards valve), 2 prosthetic valves, or recent arterial embolism should be considered for standard intravenous heparin therapy perioperatively. A preoperative cardiac risk assessment involves obtaining a thorough history and physical examination, along with a baseline electrocardiogram. Established cardiac diseases, including IHD, hypertension, arrhythmia, valvular heart disease, CHF, and the presence of a pacemaker or implantable defibrillator should be sought as part of the patient's history. See Patient- and Procedure-Related Factors. See the algorithm presented in the image shown below. Dobutamine is a beta-receptor agonist that increases both heart rate and contractility. In combination with echocardiography, regional wall abnormalities and, thus, ischemia may be assessed. The negative and positive likelihood ratios of dobutamine stress echocardiography for detecting coronary artery disease are 0 and 4.5, respectively. Of note, avoid dobutamine stress echocardiography testing in patients with a history of ventricular tachyarrhythmia (see image below). Perioperative cardiac management. 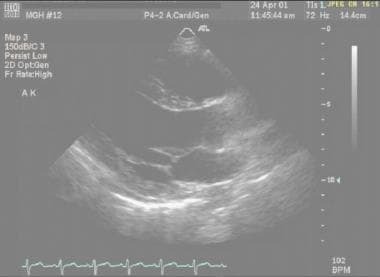 The transthoracic echocardiogram illustrates a parasternal long axis view of the left ventricle with preserved cardiac function. Intravenous dipyridamole (Persantine) increases coronary blood flow to the myocardium 2- to 3-fold. Viable myocardial cells take up thallium-201, a radionucleotide tracer, in proportion to blood flow. Hence, delayed thallium redistribution following dipyridamole helps identify areas of ischemia (see image below). The test has a negative predictive value (NPV) of 95-100% for coronary artery disease in patients having vascular surgery; negative results have a likelihood ratio (LR) of 0.12, whereas positive results have an LR of 3.02. Perioperative cardiac management. The sestamibi perfusion scan illustrates reversible ischemia in the anterior wall of the myocardium, comparing rest and stress images. Of note, be cautious when performing Persantine thallium scanning in patients with an underlying history of reactive airway disease, including asthma and severe chronic obstructive pulmonary disease (COPD). Studies to date have not evaluated the role of coronary angiography as a risk predictor. 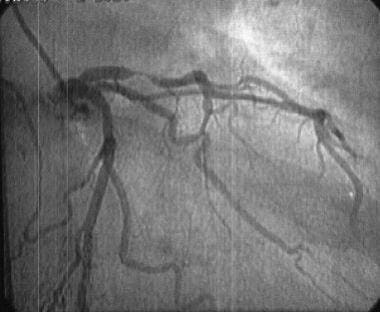 Coronary angiography should not be performed routinely in all vascular patients, but it is generally recommended for those individuals with clinical or noninvasive evidence of coronary artery disease, as determined by dobutamine echocardiography results or Persantine methoxyisobutyl isonitrile testing. Furthermore, indications for coronary artery bypass grafting (CABG) before noncardiac surgery are identical to those established by the ACC/AHA guidelines for CABG, in particular left main disease and critical 3 vessel disease with a reduced ejection fraction (see the following image). Perioperative cardiac management. Coronary angiogram revealing severe left circumflex and left anterior descending disease. Noninvasive measurement of left ventricular systolic dysfunction was once considered predictive of increased perioperative cardiac complications because the noninvasive measurement was considered an indirect measurement of left heart failure. This finding no longer holds true because transthoracic echocardiography does not provide any further data over the clinical cardiac examination for predicting perioperative cardiac complications. Although a high ejection fraction is associated with a low perioperative cardiac risk, even a normal ejection fraction cannot exclude severe coronary artery disease. Transthoracic echocardiography does play an important role in evaluating the severity of stenotic and regurgitant valvular lesions. Exercise stress testing is useful in patients who are able to exercise, but a significant percentage of patients undergoing noncardiac surgery are unable to reach the maximal predicted heart rate, given the magnitude of their concomitant vascular disease. In those individuals able to walk the treadmill, the sensitivity and specificity for predicting coronary artery disease are 65% and 85%, respectively. Studies have confirmed that exercise stress testing does not provide a high NPV. Physiologically, exercise increases the heart rate and systemic vascular resistance, thus increasing oxygen consumption by the myocardium. Therefore, a positive test result indicates a high risk of developing ischemia perioperatively. However, many ischemic events occurring intraoperatively are not associated with changes in the heart rate or blood pressure; therefore, the minimal threshold of myocardial oxygen utilization to evoke ischemia is not reached, and the significance of a negative stress test result is misleading. Although preliminary data suggested that the absence of ST depression had an NPV of 99%, this finding no longer holds true. The stress of surgery results in the release of catecholamines. Increasing the rate-pressure product may predispose the patient to a cardiac event. In 1996, Mangano et al evaluated the role of atenolol perioperatively in reducing long-term cardiac morbidity and mortality. Patients received a beta-blocker if they had known coronary artery disease or met 2 of the following criteria: older than 65 years, hypertension, total cholesterol level higher than 6.2 mmol/L, smoking history, or diabetes mellitus. Atenolol produced a 15% absolute risk reduction in the end points of MI, unstable angina, CHF requiring hospitalization, or death at 6 months and reduced mortality at 6 months and 2 years in noncardiac surgery. Similarly, another randomized controlled trial evaluating the cardioprotective effects of bisoprolol in high-risk patients undergoing vascular surgery was performed. The study was stopped early because of the dramatic results. In 1999, Poldermans et al screened 1351 patients awaiting vascular surgery and included those who had one or more cardiac risk factors and positive results on a dobutamine echocardiography study. The 112 patients remaining were randomized to receive either standard care or standard care plus bisoprolol. Bisoprolol, at a dose of 10 mg PO qd given 1 week preoperatively and continued for 1 month postoperatively, reduced the incidence of perioperative death from cardiac causes and nonfatal MI. Consequently, when possible, beta-blockers should be started 1 week before elective surgery, with the dose titrated to a resting heart rate of 50-60. As for the use of nitrates, digitalis, and calciumblockers, no studies have evaluated their use in the perioperative state. Historically, postoperative MI carried a grave prognosis (ie, >50% mortality rate). Postoperative ischemia is well characterized, with its peak incidence within 48 hours of surgery. Postoperative ischemia is clinically silent in more than 90% of cases. The Perioperative Ischemia Research Group evaluated the use of continuous echocardiographic monitoring perioperatively and found that ischemia occurred most frequently on postoperative days 1 and 2 (ie, 20% preoperative, 25% intraoperative, 55% postoperative). Because postoperative ischemia can be more deleterious than ischemia detected at other times, interventions, including the perioperative use of beta-blockers and high-dose narcotic analgesia to reduce postoperative pain, are recommended. What is perioperative cardiac management? What are cardiac effects of general anesthesia relevant to perioperative cardiac management? What are cardiac effects of regional anesthesia relevant to perioperative cardiac management? How does hypertension affect perioperative cardiac management? How does congestive heart failure affect perioperative cardiac management? How does ischemic heart disease (IHD) affect perioperative cardiac management? How does aortic stenosis (AS) affect perioperative cardiac management? How does anticoagulation affect perioperative cardiac management? How is surgical risk assessed during perioperative cardiac management? How is preoperative cardiac risk assessed? What is the role of clinical markers in the preoperative cardiac risk assessment? What is the role of functional capacity in the preoperative cardiac risk assessment? What is the algorithm for preoperative cardiac risk assessment? What is the role of dobutamine stress echocardiography in perioperative cardiac management? 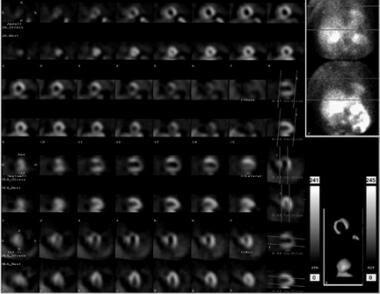 What is the role of dipyridamole thallium imaging in perioperative cardiac management? What is the role of coronary angiography in perioperative cardiac management? What is the role of transthoracic echocardiography in perioperative cardiac management? What is the role of exercise treadmill testing in perioperative cardiac management? What is the role of ambulatory electrocardiographic monitoring in perioperative cardiac management? What is included in preoperative and intraoperative cardiac management? What is included in postoperative cardiac management? What is the role of antimicrobial prophylaxis in the perioperative management of cardiac patients? What is the antimicrobial regimen used for prophylaxis in the perioperative management of cardiac patients? Augoustides JG, Neuman MD, Al-Ghofaily L, Silvay G. Preoperative cardiac risk assessment for noncardiac surgery: defining costs and risks. J Cardiothorac Vasc Anesth. 2013 Apr. 27(2):395-9. [Medline]. Hübner M, Lovely JK, Huebner M, Slettedahl SW, Jacob AK, Larson DW. Intrathecal Analgesia and Restrictive Perioperative Fluid Management within Enhanced Recovery Pathway: Hemodynamic Implications. J Am Coll Surg. 2013 Apr 23. [Medline]. Detsky AS, Abrams HB, McLaughlin JR, et al. Predicting cardiac complications in patients undergoing non-cardiac surgery. J Gen Intern Med. 1(4):211-9. [Medline]. Upshaw J, Kiernan MS. Preoperative cardiac risk assessment for noncardiac surgery in patients with heart failure. Curr Heart Fail Rep. 2013 Jun. 10(2):147-56. [Medline]. Shah KB, Kleinman BS, Rao TL, et al. Angina and other risk factors in patients with cardiac diseases undergoing noncardiac operations. Anesth Analg. 70(3):240-7. [Medline]. [Guideline] Fleisher LA, Fleischmann KE, Auerbach AD, Barnason SA, Beckman JA, Bozkurt B, et al. 2014 ACC/AHA guideline on perioperative cardiovascular evaluation and management of patients undergoing noncardiac surgery: a report of the American College of Cardiology/American Heart Association Task Force on Practice Guidelines. Circulation. 2014 Dec 9. 130 (24):e278-333. [Medline]. [Full Text]. [Guideline] Kristensen SD, Knuuti J, Saraste A, et al, Authors/Task Force Members. 2014 ESC/ESA Guidelines on non-cardiac surgery: cardiovascular assessment and management: The Joint Task Force on non-cardiac surgery: cardiovascular assessment and management of the European Society of Cardiology (ESC) and the European Society of Anaesthesiology (ESA). Eur Heart J. 2014 Sep 14. 35 (35):2383-431. [Medline]. [Full Text]. Tongyoo S, Permpikul C, Haemin R, Epichath N. Predicting factors, incidence and prognosis of cardiac arrhythmia in medical, non-acute coronary syndrome, critically ill patients. J Med Assoc Thai. 2013 Feb. 96 Suppl 2:S238-45. [Medline]. Mangano DT, Layug EL, Wallace A, Tateo I. Effect of atenolol on mortality and cardiovascular morbidity after noncardiac surgery. Multicenter Study of Perioperative Ischemia Research Group. N Engl J Med. 335(23):1713-20. [Medline]. Poldermans D, Boersma E, Bax JJ, et al. The effect of bisoprolol on perioperative mortality and myocardial infarction in high-risk patients undergoing vascular surgery. Dutch Echocardiographic Cardiac Risk Evaluation Applying Stress Echocardiography Study Group. N Engl J Med. 1999 Dec 9. 341(24):1789-94. [Medline]. Devereaux PJ, Xavier D, Pogue J, Guyatt G, Sigamani A, Garutti I, et al. Characteristics and Short-Term Prognosis of Perioperative Myocardial Infarction in Patients Undergoing Noncardiac Surgery: A Cohort Study. Ann Intern Med. 2011 Apr 19. 154(8):523-528. [Medline]. Puelacher C, Lurati Buse G, Seeberger D, et al. Perioperative Myocardial Injury After Noncardiac Surgery: Incidence, Mortality, and Characterization. Circulation. 2018 Mar 20. 137 (12):1221-1232. [Medline]. Wendling P. Evidence Mounts for Myocardial Injury After Noncardiac Surgery. Medscape Medical News. Available at https://www.medscape.com/viewarticle/889852#vp_1. December 11, 2017; Accessed: February 4, 2019. [Guideline] Baddour LM, Wilson WR, Bayer AS, Fowler VG Jr, Tleyjeh IM, Rybak MJ, et al. Infective Endocarditis in Adults: Diagnosis, Antimicrobial Therapy, and Management of Complications: A Scientific Statement for Healthcare Professionals From the American Heart Association. Circulation. 2015 Sep 15. [Medline]. [Full Text]. American Society of Anesthesiologists. Practice Advisory for the Perioperative Management of Patients with Cardiac Rhythm Management Devices: Pacemakers and Implantable Cardioverter-Defibrillators: A Report by the American Society of Anesthesiologists Task Force on Perioperative Management of. Anesthesiology. 2005 Jul. 103(1):186-198. [Medline]. Ashley EA, Vagelos RH. Preoperative cardiac evaluation: mechanisms, assessment, and reduction of risk. Thorac Surg Clin. 2005 May. 15(2):263-75. [Medline]. Barash PG. Preoperative evaluation of the cardiac patient for noncardiac surgery. Can J Anaesth. 1991 May. 38(4 Pt 2):R134-44. [Medline]. Boersma E, Poldermans D, Bax JJ, et al. Predictors of cardiac events after major vascular surgery: Role of clinical characteristics, dobutamine echocardiography, and beta-blocker therapy. JAMA. 285(14):1865-73. [Medline]. Eagle KA, Berger PB, Calkins H, et al. ACC/AHA guideline update for perioperative cardiovascular evaluation for noncardiac surgery---executive summary a report of the American College of Cardiology/American Heart Association Task Force on Practice Guidelines. Circulation. 105(10):1257-67. [Medline]. Eagle KA, Brundage BH, Chaitman BR, et al. Guidelines for perioperative cardiovascular evaluation for noncardiac surgery. Report of the American College of Cardiology/American Heart Association Task Force on Practice Guidelines. J Am Coll Cardiol. 1996 Mar 15. 27(4):910-48. [Medline]. Fleisher LA, Barash PG. Preoperative cardiac evaluation for noncardiac surgery: a functional approach. Anesth Analg. 1992 Apr. 74(4):586-98. [Medline]. Gerson MC. Cardiac risk evaluation and management in noncardiac surgery. Clin Chest Med. 1993 Jun. 14(2):263-81. [Medline]. Goldman L, Caldera DL, Nussbaum SR. Multifactorial index of cardiac risk in noncardiac surgical procedures. N Engl J Med. 1977 Oct 20. 297(16):845-50. [Medline]. Hollenberg SM. Preoperative cardiac risk assessment. Chest. 1999 May. 115(5 Suppl):51S-57S. [Medline]. Krupski WC, Bensard DD. Preoperative cardiac risk management. Surg Clin North Am. 75(4):647-63. [Medline]. Lemaire JB, Ghali W. How to estimate perioperative cardiac risk. Perspect Cardiol. 1998. 51-9. McCallion J, Krenis LJ. 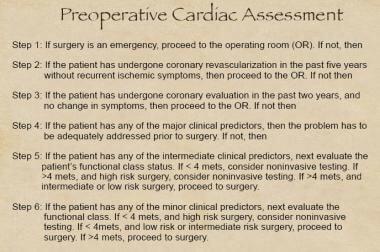 Preoperative cardiac evaluation. Am Fam Physician. 1992 Apr. 45(4):1723-32. [Medline]. Palda VA, Detsky AS. Perioperative assessment and management of risk from coronary artery disease. Ann Intern Med. 1997 Aug 15. 127(4):313-28. [Medline]. Potyk D, Raudaskoski P. Preoperative cardiac evaluation for elective noncardiac surgery. Arch Fam Med. 1998 Mar-Apr. 7(2):164-73. [Medline]. Raymer K, Yang H. Patients with aortic stenosis: cardiac complications in non-cardiac surgery. Can J Anaesth. 1998 Sep. 45(9):855-9. [Medline]. [Guideline] American Society of Anesthesiologists. Practice advisory for the perioperative management of patients with cardiac implantable electronic devices: pacemakers and implantable cardioverter-defibrillators: an updated report by the american society of anesthesiologists task force on perioperative management of patients with cardiac implantable electronic devices. Anesthesiology. 2011 Feb. 114 (2):247-61. [Medline]. [Full Text]. The authors and editors of eMedicine gratefully acknowledge the contributions of previous author, Tomas G Neilan, MD, to the development and writing of this article. Fast Five Quiz: How Much Do You Know About Cardiovascular Risk Factors? Fast Five Quiz: How Much Do You Know About Facilitating Healthy Weight Loss? Fast Five Quiz: Are You Familiar With Herbal Products and Dietary Supplements? Fast Five Quiz: How Much Do You Know About Medical Factors That Help and Hinder Memory? Fast Five Quiz: Are You Familiar With the Various Factors That Influence Cardiac Rehabilitation and Best Practices?